This installation pursues playful collaboration. By placing the modules through arbitrary configurations the idea behind this collective experience is to create scenarios where people can collaboratively create infinite layouts that generate perceivable chain reactions. The way to trigger the installation is through a playful gesture similar to bocce where spheres can ignite the layout anywhere in the installation. After an apparent success –context-specific– and consequent failure –altered context– the project turned onto a functional alternative. The next process better illustrates it. These images show the initial thought out circuit that included a working sound triggered by a –static– threshold. We also experimented with Adafruit's Trinket aiming towards circuit simplification, cost-effectiveness and miniaturization. 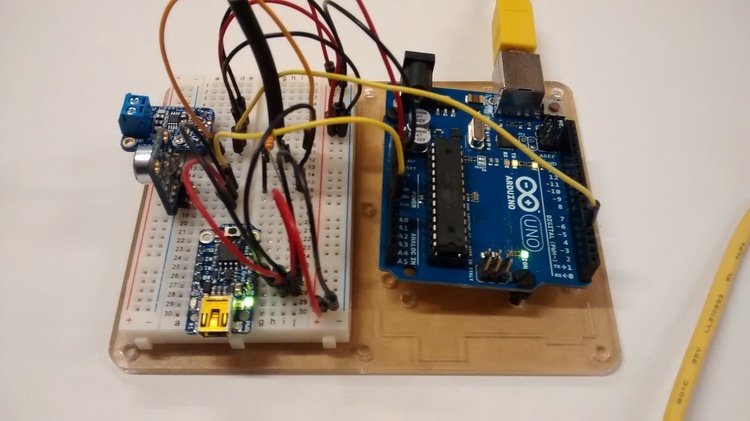 This shrunk micro controller is composed by an ATTiny85 nicely breadboarded and boot-loaded. In the beginning we were able to upload digital output sequences to drive the speaker and LED included in the circuit design. However, the main blockage we manage to overcome in the end was reading the analog input signal used by the microphone. The last image illustrates the incorporation of a speaker amplifier to improve the speaker's output. 2. the difference between a normal speaker output signal and an amplified speaker output signal. After the first full-on tryout, it was clear that a dynamic threshold –the value that sets the trigger adapts accordingly to its ambient–. The microphone however, broke one day before the deadline, so we never got to try this tentative solution –even though there's an initial code–. Plan B, use the Call-To-InterAction event instead. In other words, use collision and the vibration it generates to trigger the modules through a piezo. Here's the code. A couple videos that illustrate the colliding key moments that trigger the beginning of a thrilling pursue.